Executive summary—Improving the aerodynamic design of an industrial glider flying at Mach 0.08 was the goal of this project: “RBF-based aerodynamic optimization of an industrial glider,” Emiliano Costa, D’Appolonia SpA, Rome, Italy; Marco E. Biancolini, Corrado Groth, University of Rome Tor Vergata, Rome, Italy; Ubaldo Cella, Design Methods (www.designmethods.aero), Messina, Italy; Gregor Veble, Matej Andrejasic, Pipistrel d.o.o., Ajdovščina, Slovenia. The original design exhibited performance-degrading separation in the wing-fuselage junction region at high incidence angles. Using a numerical optimization approach designed to be affordable even with limited HPC resources, the separation was significantly reduced by updating the local geometry of fuselage and fairing while maintaining the wing airfoil unchanged. Shape variations were applied to the glider’s baseline configuration through a mesh morphing technique founded on the mathematical framework of radial basis functions (RBFs). 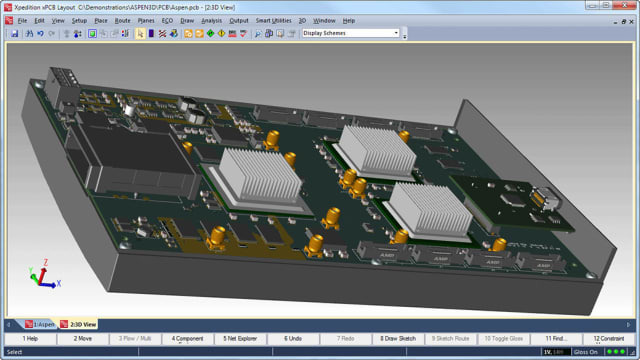 Computational outputs were obtained using a combination of ANSYS DesignXplorer, ANSYS Fluent and RBF Morph software working in the ANSYS Workbench environment. The k-ω SST turbulence model was used with two levels of structured hexahedral meshes, both generated using ANSYS ICEM CFD: a coarse grid used to apply wall functions, and a fine version with cell clustering used to solve the boundary layer up to the wall. The coarse mesh allowed quick tuning and setup of the overall workflow, reserving use of the high-fidelity mesh for the final optimization run. Two shape modifiers were set up by means of RBF Morph to drive shape morphing, guaranteeing at the same time the satisfaction of manufacturing constraints. Once the RBF solutions were computed and made available, a DoE optimization calculation was set up using ANSYS DesignXplorer and, after performing CFD runs through ANSYS Fluent, the potential optimal candidates maximizing aerodynamic efficiency were identified by means of the response surface approach. Significantly improved aerodynamic efficiency was achieved by altering the glider’s geometry to accord with the selected optimal design point. This optimization study was part of an exploratory set of analyses focused on better addressing the numerical strategies to be employed in the development of the EU FP7 Project RBF4AERO. Introduction—The Taurus glider, designed and manufactured by Pipistrel d.o.o. Ajdovščina Slovenia (Figures 1 and 2), is a side-by-side two-seat self-launching ultralight glider made of composite materials. The wing is located in a vertical central position with respect to the fuselage, while its longitudinal position is aft of the maximum section, behind the cockpit, in a significant positive pressure gradient. Because of this configuration, in the fuselage junction region the wing suffers an extra increase in flow velocity close to the leading edge and a significant adverse pressure gradient in the trailing-edge region that cause a leading-edge separation at high angles of attack (AoA). The problem is particularly felt when lowering the Reynolds number (increasing the altitude), decreasing the aircraft’s overall aerodynamic efficiency in maneuvering. The occurrence of separated flow conditions was demonstrated experimentally in flight tests (Figure 3). The flow attachment on the glider’s shape was monitored by means of small rectangular pieces of adhesive tape—tufts. Unordered direction of tufts at the wing/fuselage fairing clearly indicated a detached flow propagating in a delta shape in the streamwise direction. The main objective of this project was to apply a shape optimization numerical procedure based on mesh morphing in order to diminish this separation region and thus enhance the aerodynamic efficiency of the glider. Another objective was to show how the glider can be aerodynamically optimized using a low-computational-demand approach to carry out the optimization analysis, using the high-demand computational model only to confirm and deepen the numerical results. This study was part of a set of exploratory analyses aimed at anticipating the investigation of the proper shape modifications to be applied in carrying out the scheduled computational applications of the RBF4AERO Project. Shape optimization through RBF mesh morphing technique—RBFs are a class of mathematical interpolation functions that, in CAE applications, can be used to drive mesh morphing (smoothing) of the discretized domain of the computational model, applying predefined displacements to a set of purposely generated points called source points. As an example, Figure 4 depicts the localization of source nodes studied in this project. The main characteristics of such an approach are the meshless property, the preservation of mesh consistency and the low disk usage in addition to standard calculation, while its main advantages include exact control of nodes during smoothing, prevention of remeshing noise, the ability to be fully integrated in the computing process, and high performance in handling large models. The RBF mesh morphing technique is the core of the RBF4AERO Project aimed at developing the RBF4AERO Benchmark Technology, an integrated numerical platform and methodology to efficiently address the most demanding challenges of aircraft design and optimization. This project represents an occasion to further develop and extend the application of mesh morphing in the aviation sector, following its recognition and application in the automotive, motorsports, naval and medical industries. In particular, the intent of RBF4AERO is to cover modern aeronautical design applications such as shape optimization, ice accretion simulation, fluid-structure interaction, adjoint-morphing coupling and multiphysics optimization analyses through efficient procedures based on RBF mesh morphing so as to avoid the compromises typical of standard optimization procedures in terms of speed, accuracy and extent. The optimization workflow used in this project is shown in Figure 5. Rectangular blocks represent computational data, circular blocks identify specific operations or features, while blocks dealing with the use of the same tool are grouped by color. This workflow, managed entirely in the ANSYS Workbench (WB) environment, anticipates availability of the CAD model representing the baseline configuration of the model to be studied, and provides, as final output, the CAD model of the optimized shapes of the model. In particular, the most highly automated operations are those performed by ANSYS DesignXplorer (DX), which acts as driver of the entire optimization procedure and whose functioning needs the CFD model of the baseline configuration and access to stored RBF solutions. DX supports the sequential accomplishment of the main phases of optimization. Specifically, the first phase envisages the partial populating of the design of experiment (DoE) table, having a number of rows and columns respectively equal to the number of design points (DPs) and the summation of shape variations and objective functions (aerodynamic coefficients and efficiency). The filled portion concerns the combinations of RBF solutions’ amplification values, whereas the unfilled portion (blank columns) waits for the computing of the objective functions. Successively, once a CFD simulation is run for each DP (DoE analysis), the DoE table is completed and its data can be processed and visualized through the response surface method (RSM). At this point, the optimization can be completed in order to identify the optimal combination of RBF solutions that, applied to the baseline CFD model and starting CAD model, generates the optimal CFD model and CAD configuration respectively. Worth noting is that the optimal solution identification can be carried out in different ways depending on specific design needs, the optimization strategy adopted or the final accuracy required, while the CAD model of the optimized configuration is ultimately obtained by morphing the starting CAD model through the back2CAD feature of RBF Morph. The k-ω SST turbulence model was used with two levels of structured hexahedral meshes, both generated using ANSYS ICEM CFD: a coarse grid to be used applying wall functions and a fine version with cells clustering aimed to solve the boundary layer up to the wall. The coarse mesh allows quick tuning and setup of the overall workflow, reserving the high-fidelity mesh for the final optimization run. Two shape modifiers were set up by means of RBF Morph to drive shape morphing, guaranteeing at the same time the satisfaction of manufacturing constraints. Once the RBF solutions were computed and made available, a DoE optimization calculation was set up using ANSYS DesignXplorer and, after performing CFD runs through ANSYS Fluent, the potential optimal candidates maximizing the aerodynamic efficiency were identified by means of the response surface approach. A relevant aerodynamic efficiency improvement was finally gained, molding the glider’s geometry according to the selected optimal design point. The significant reduction of separation obtained on the optimized solution with respect to the baseline geometry is evident. Moreover, the coarse-configuration tendency to overestimate the separation is confirmed as well. The profile of the pressure coefficient at the same sections of the wing already supplied for both the coarse and fine model in the optimal configuration are reported in Figure 18. The reduced separation and the lift increase are also clear from this plots if compared with the pressure distribution obtained on the baseline configuration (Figure 9). In the table below, the main results related to aerodynamic coefficients obtained for the morphed optimal models of the glider are summarized. Such data evidence the achievement of the objectives of the present work: First, the aerodynamic efficiency of the optimal configuration is relevantly improved (33.93%). Second, since the aerodynamic efficiency relative variation percentage is almost maintained for the coarse and fine optimal model (33.51% and 33.93% respectively), both the qualitative and quantitative coherency of the numerical behavior of the coarse and fine model are positively verified and, consequently, the reliability of the adopted resolution strategy is successfully confirmed. To finalize the proposed numerical optimization approach, the CAD model of the optimized configuration, shown in Figure 19, was obtained using the back2CAD feature of RBF Morph. As previously outlined, to achieve this result, the starting CAD model of the geometry in STEP format was morphed, applying the combination of amplification values defined by the Candidate Point 3. Conclusions—This project demonstrated a numerical procedure to enhance the aerodynamic efficiency of an industrial glider. This procedure, managed entirely in the ANSYS Workbench environment, was based on the DoE approach and a mesh morphing technique which allows substantial time savings because it makes use of only the computational model of the baseline configuration. Indeed, all the variations explored are generated at run time thanks to the parametric nature of the method. A related improvement in reduction of the separation region and enhancement of aerodynamic efficiency was obtained in conformance with manufacturing constraints. The employed resolution strategy adopts, to begin, a low- computational-demand CFD model to carry out the DoE optimization analysis, and subsequently a more accurate model to verify the optimal solution obtained. Worth noting is how this simplified workflow, affordable even with a small HPC facility, makes it possible to arrive at an optimal shape demonstrating substantial performance improvement: the increase in efficiency as computed by the high-fidelity mesh is close to 34%.